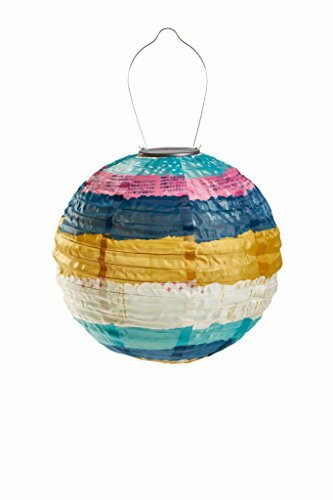 The Soji Printed Series Celestial Stripe solar lantern features beautiful blues, yellow and a pop of pink making this celestial print globe truly unique among our solar lantern offerings. Pair this design with our other Printed Series designs to compliment your home landscape. Lanterns include a stainless steel hanging handle, solar panel, a built-in light sensor, one AAA rechargeable battery and a dual white LED Light. Allsop Home & Garden (Bellingham,WA) was founded by a father and daughter who were inspired to create the world’s most unique solar-powered lighting. We have become widely recognized as an industry leader in decorative outdoor lighting and our new patented designs continue to inspire and illuminate outdoor spaces around the world. If you have any questions about this product by Allsop Home and Garden, contact us by completing and submitting the form below. If you are looking for a specif part number, please include it with your message.